A cholesterol diet aims to regulate the levels of cholesterol in the blood stream in order to prevent heart disease. Cholesterol is a soft, waxy substance found among the lipids (fats) in the bloodstream and in all cells of the body. It helps to form cell membranes and some hormones, and performs other functions necessary in a healthy body. Cholesterol and other fats don’t dissolve in the blood, and are transported to and from cells by special carriers called lipoproteins. Those of significance in a cholesterol diet are low-density lipoprotein (LDL) and high-density lipoprotein (HDL). LDL is the major cholesterol carrier in the blood. If too much LDL cholesterol circulates, it can gradually build up in the walls of the arteries feeding the heart and brain, forming plaque that can clog those arteries – a condition known as arteriosclerosis. A clot forming near this plaque could block the blood flow to part of the heart muscle causing a heart attack, or to part of the brain, causing a stroke. A high level of LDL cholesterol (160 mg/dL and above) presents an increased risk of heart disease, so LDL cholesterol is called “bad” cholesterol. Lower levels of LDL cholesterol reflect a lower risk of heart disease. Anyone with heart disease, should aim for LDL cholesterol levels of less than 100 mg/dL. 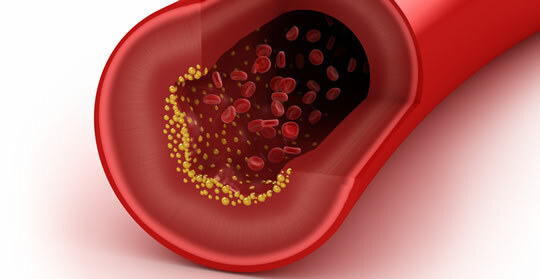 About a third to a quarter of blood cholesterol is carried by HDL cholesterol. It is thought that HDL tends to carry cholesterol away from the arteries and back to the liver, where it’s passed from the body. Some experts believe HDL removes excess cholesterol from plaques, thus slowing their growth. So HDL cholesterol is known as “good” cholesterol because a high HDL level seems to protect against heart attack. Conversely, a low HDL level (less than 40 mg/dL) indicates a greater risk of heart attack and possibly stroke. Cholesterol lowering diets aim to balance LDL and HDL cholesterol to reduce the risks. Low Fat Diets– This type of approach seeks to remove all saturated fat from the diet. It is believed that if cholesterol isn’t consumed, then it won’t build up in the bloodstream. However, this approach only helps about 5% of those with high cholesterol. Low Glycemic and Healthy Fats Approach– With this method dieters avoid high glycemic carbs and eat healthy fats from fish, olives, nuts, and flax seed. This type of cholesterol diet is high in fresh vegetables and fruit as well as legumes. This diet seeks to limit inflammation instead of dietary cholesterol. Great Cholesterol Myth In The Great Cholesterol Myth nutritionist Jonny Bowden and cardiologist Dr. Stephen Sinatra reveal the true causes of heart disease. Lower Your Cholesterol Reveals how to eat all the foods you love and lower cholesterol at the same time. Cholesterol Lowering French Recipes Award winning chef, Alain Braux, teaches you how to lower cholesterol using delicious French gourmet food. Other low fat recipes can be found here. There are also some supplements that can be used as part of a cholesterol diet. Fiber supplements containing soluble fiber. While some experts may disagree about which foods to eat, there are some common food that should be avoided by those on a cholesterol diet. Trans fat and hydrogenated oils. A cholesterol diet isn’t just about the foods a person eats. Stress can also play a major role in preventing heart disease and improving health. Learning how to handle stress constructively can lead to better heart health. Also adequate exercise is a necessary part of the cholesterol diet. Dieters should get at least 30 minutes of exercise a day. Your site is very informational for me. I learned way more from your site than I did from my own doctor. Thank you! Some cholesterol is converted into bile acids to aid in lipid digestion. A good deal of the bile is recycled, a small amount is excreted in stool. This is, really, the ONLY way we get rid of cholesterol (we don’t metabolize it for energy, we just shuffle it around in various other forms, like cell components or hormones). However, by consuming a high fiber diet, frequent bulky bowel movements will reduce some of the bile recycling, thereby increasing elimination. Increase output and decrease input and your cholesterol level drops. i would not suggest that anyone use laxatives on a regular basis without “need”. the body will adjust and one could become dependent on the medicine and cause other gi problems. Laxative 3 times a day!!!! whoooo!!! I hope that toilet holds up well. Overall the info on HDL vs LDL is accurate. I dont agree with this type of diet. I recommend a diet filled Omega-3 and 6, a glass of wine and exercise to increase HDL (good cholesterol.